MyQ Amusement Park is over 8 hectare wide divided into five areas: outdoor games, indoor games, water park, light & water show area and cuisine & souvenir shops area. With unique designs, indoor game zone has a ventilated space. It has a lot of games, which are varied, attractive, fit for different ages. Besides the normal games, it has a lot of games applied high-tech such as 4D movie theaters, bumper electric cars, mysterious games, etc. In this zone, there are also three special parts: exhibition zone and monuments; children’s playground – where they can enjoy the fantasy world with fairies, princes, princesses…; and zone of puppet shows – where visitors can learn more about one of distinctive arts of Vietnamese. 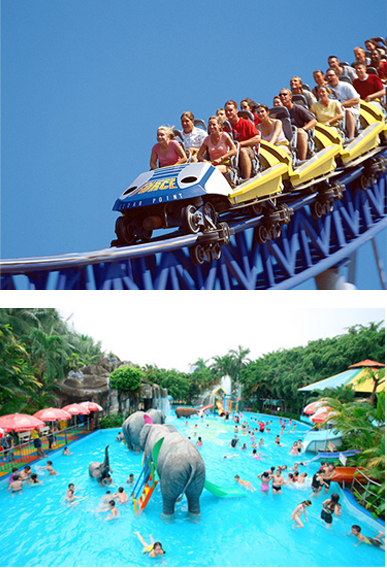 Besides indoor games, outdoor games are also an unique point in MyQ Amusement Park. 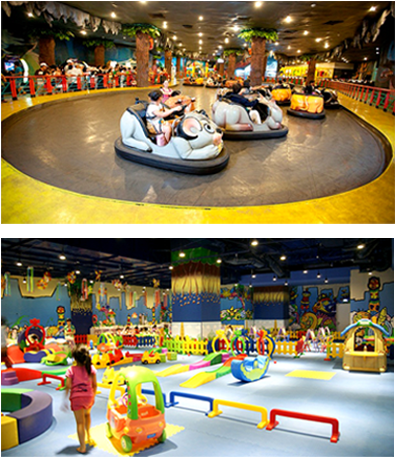 With lots of exciting games such as rollercoaster, flying bicycle, pirate ship …, outdoor games will definitely be attractive to visitors and appealing them to be the conquerors, curiousness and challenging their courage. Water park is built with an area of 1.5 hectare. Here, you can set your own “menu” for your “water party” with numerous attractive and original games suitable for all family members. In the immense space of water, you and your beloved ones will enjoy the best fun and experience sheer pleasure with thrilling games or discover and absolutely relax with safe and scientific games. 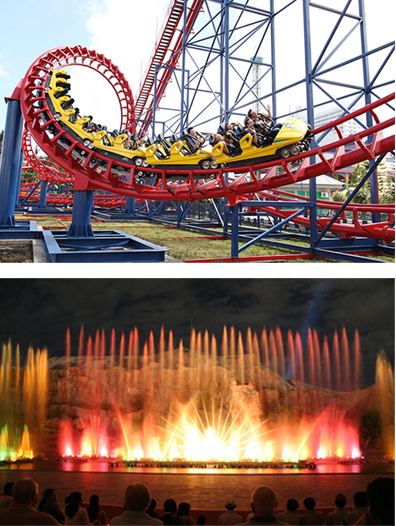 MyQ Amusement Park has two light & water stages with intelligent design, excellent sound and lighting equipment prides itself to be the most modern light & water show in Vietnam and a comparable show to famous shows in Asia. With the wonderful blend and special motion effects of sound, light, fire and water, light & water shows in MyQ Amusement Park brings you the technical excellence, sparkling and colorful art performances. Nestled by a road in MyQ Amusement Park, Cuisine area is an ideal destination for visitors who love the fresh and peaceful atmosphere, and shopping mall is designed as a harmonious space of traditional and modern, sensitive features appealing to visitors. This is also an area where visitors can halt for a rest and enjoy out-of-the-world dishes after taking a jolly time at MyQ Amusement Park. 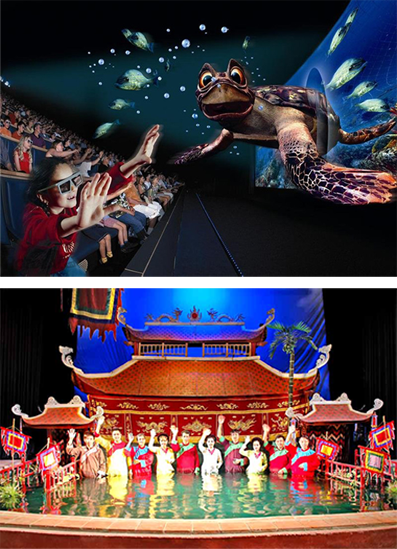 4D films is a system that combines a 3D film with physical effects such as rain, wind, strobe lights, vibration and smell that occur in the theater in synchronization with the film. At MyQ Amusement Park, the modern and luxurious 4D film rooms not only bring you chances to admire cinema masterpieces but also move with each beat of thrilling and attractive, life-like stories. MyQ Safari is the first safari in Vietnam having water puppet performances – an art has been seemed as “the soul of Vietnamese villages”. With the combination of colorful puppets and hands of artists, you will be back to your childhood. Being true to its name, roller Coaster is a game with sudden changes of speed and direction. On curved railway, with the height of 30m and speed up to 75km/h, the Roller Coasters will strongly impress you with powerful swaying and thrilling moments. With its 7000 seat, light & water stages have intelligent design, excellent sound and lighting equipment prides itself to be the most modern light & water show in Vietnam and a comparable show to famous shows in Asia. With the wonderful blend and special motion effects of sound, light, fire and water, light & water shows in MyQ Amusement Park brings you the great art performances. 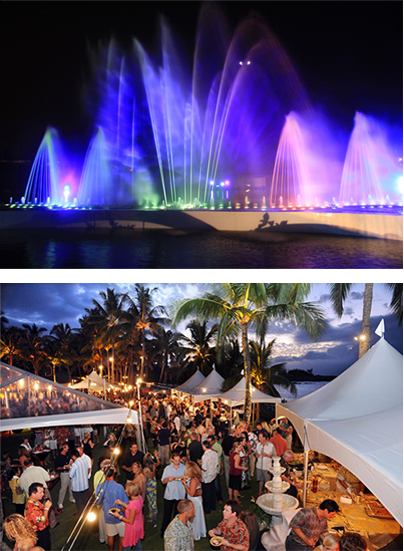 This is also an ideal venue for national and international events.